Looking for suggestions on how to commute to some hunting spots on my bike with the detector. I do have some small soft sided saddle bags on the bike and can break it down into 2 peices sticking in the bags, but am sure it will stick out quite a bit since the bags are only about 1 foot deep. Just curious if anyone has any other suggestions on how to safely carry their machines on the bike? 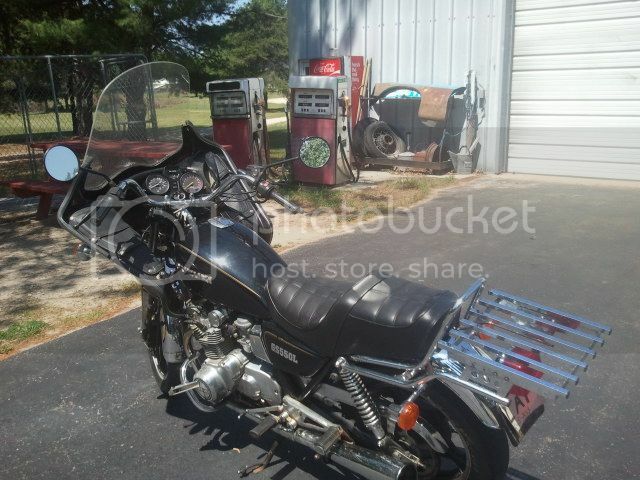 I have done a search and seen a couple post mixed in some threads with people just bungeeing the machine across the handlebars, but I have a fairing on the front of the bike and dont feel its very safe to have it on the bike like that. I keep coming back to the backpack idea as I feel its the safest way I can think of but wanted to make sure I am not missing some other obvious way of carrying it along. 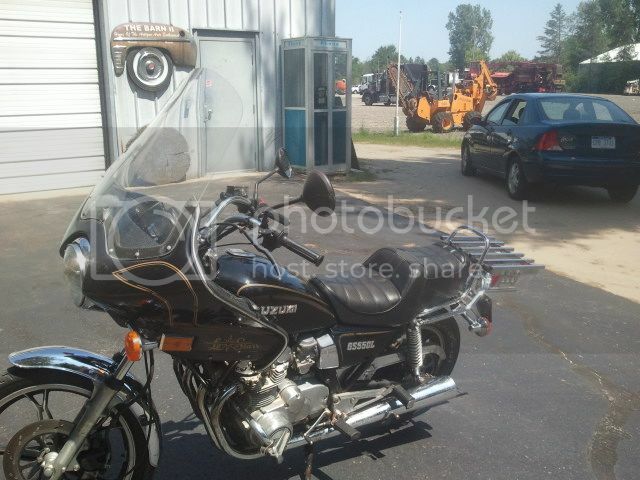 The bike is a 81 GS550L with a vetter style fairing, and the detector is the AT PRO. I've got similar questions, and I'm glad that you posted this! I have a backpack bag for the ATP, but it doesn't seem really designed for wearing while sitting on a bike. I'd love to see what other brothers/sisters have done! what type of bike? do you have a sissy bar in the back? with a tall sissy bar you could strap it vertically. but i think the easiest way would be in a good backpack. i carried fishing rods like this all the time. my backpack of choice was the kelty redwing series. I don't see why bungees along the side wouldn't work. I tried holding it up in all kinds of spots on the side and just cant find a place that it would sit well without sticking out too much causing shifting/braking issues. With it being a 4 cylinder the engine is pretty wide already so any extra width makes it hard to keep your feet on the pegs. Here is my bike. Right now it has the lower leg fairing on it since the temps are still in the 40s. I do have a sissy bar for it up in the attic which I will use but only as a last resort..... Its a big one that is literally 2 feet tall or more and just couldnt stand it from day one. Put the bike in the bed of your truck, and keep the ATP in the cab! DONT BREAK IT DOWN SIDEWAYS ON THE BIKE! coming from another non-cager grab a backpack and let it stick out. People dont see us enough as it is. Last thing you need is someone not paying attention and rocking your bars. 0 Gold, 16 Silver, 3 Sterling Hawk Nation Season Ticket Holder! the thought has crossed my mind lol.... Gonna go out and see what I can come up here again shortly. I do have some essentials in my saddle bag but may take them out when just going out MD'in. If I cant come up with anything here I am most likely just gonna go with the backpack route for the machine and I still put my pouch, diggers, pinpointer, etc in the saddle bags. Another thought I was thinking of possibly one of the bike mounts that is basically a clamp with a thumb screw that just clamps onto the frame of the bike. Thinking it may just clamp onto the shaft of the detector and then fab up some type of mounting bracket to hold off to one side towards the rear somehow. A great question. I've had the same thoughts. I have a '73 Honda 350 and would love to engage it as a way to get where I want to hunt. They make some neat gun racks that we mount on our 4 wheeler racks or handle bars that we carry rifles in. Inexpensive at sporting good stores. Just a suggestion. What about rigging a rifle sling (or something similar) to your detector? Then you could wear it bandolier style. I have transported my MD on my M/C on my last 2 hunts. I broke my Ace250 down so the longest piece is about 24". I put them into my 55 liter dry bag and roll the excess air out of it and strap it to my passenger pillion. I use a light hand when I cinch the straps down, so I don't damage my MD. Its not the best system, but it will serve me until I can come up with some sort of hard case to take it with me on my M/C. Its MD'ing at its cheapest. My bike gets around 70 mpg!! Traveling 50 miles to check a good prospect out, is no big deal when it comes to fuel cost. Well, BensJamming, considering the cost to replace your ATP, anything less than its cost invested in a safe transport measure will be profit. With a four foot tall sissy bar just waiting to be used and a metal detector which breaks into two sections, each less than four feet long, I'd break that puppy down and use the sissy bar as a support to carry it vertically. Can you have the sissy bar modified to mount on with thumb screws so that it can be removed between uses as a detector transport? I don't think I'd risk carrying it assembled strapped across the back of the bike or across the handle bars. You can laugh if you want, but I have been considering this same problem...for my moped! I have an suv, but for quick short trips, or places with limited parking, the gas miser might be best. Do NOT put anything in a backpack that is larger or harder than what you'd like to land on hard if involved in a wreck! I know too many that have had their backs broken by stuff in backpacks. If you can't strap it to the bike, leave it or the bike at home. I break my AT pro down and put it in the tour pack of my HD Ultra Classic during the good weather. That way I kill 2 birds with one stone, a bike ride and a day of detecting LOL!